Last week, we cleared off those kitchen countertops (your kitchen looks so much better, right?). Good thing, because we’ll need all of those flat surfaces in order to tackle a few food storage organization projects this week. Are you ready?? If you have a large pantry, maybe it’s become a magnet for generic items other than food in your home. Take a moment to get intentional and decide what (if any) categories of items you will allow to live in your pantry in addition to the food. Once you’ve set your criteria, you’ll know what items to sort into the Relocate pile during the Sort/Purge step. Make sure you’ve got your decluttering kit ready to go. You’ll come across many items in the refrigerator, freezer, and pantry that will need to go straight into the trash, so be sure to have plenty of trash bags on hand. Bonus! 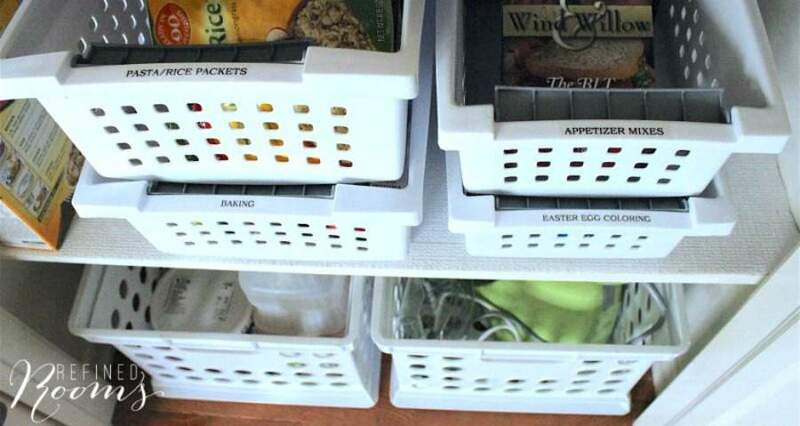 You get to complete some of your spring cleaning work this week as you organize your food storage spaces! Begin as usual by taking every item out of the space and relocating the items to your countertop/kitchen island. Clean the space top to bottom by wiping out all of the crumbs, spills, and food spills. If you’ve got a reach-in or walk-in pantry, don’t forget to clean off the baseboards as well as mop the floor. If your pantry is super huge, you may need to empty out, clean, and sort items one section of the pantry at a time. Sort items into Keep, Trash, and Relocate piles. It’s typically pretty obvious when a perishable item from the refrigerator should be chucked into the trash bag, but it can be trickier to decide when the item is non-perishable. Check out this post for tips on what food to purge and what food to keep during your sorting process if you need some guidance. You probably won’t come across a lot of items in the refrigerator/freezer that belong in the Relocate box, but it does happen in the pantry from time to time. If you have a habit of purchasing food in bulk, or buying food items because you’ve got a coupon for it (but no one in your house will actually eat it), you may want to include a Donate category. If you end up with a decent amount of food in this pile, consider donating it to your local food bank or to a friend/neighbor who can use it. It can be tricky to access loose items that get lost in the back of a side-by-side fridge. 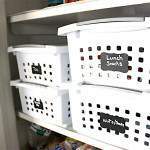 My solution is to use handled baskets and Fridge Binz to store item “families” together. And yes, we have an entire bin devoted to Mexican food (a family favorite!). These yogurt containers would be lost forever if they weren’t contained together within the fridge. Using these bins effectively transforms shelves into drawers (and drawers always trump shelves in the organizing world). 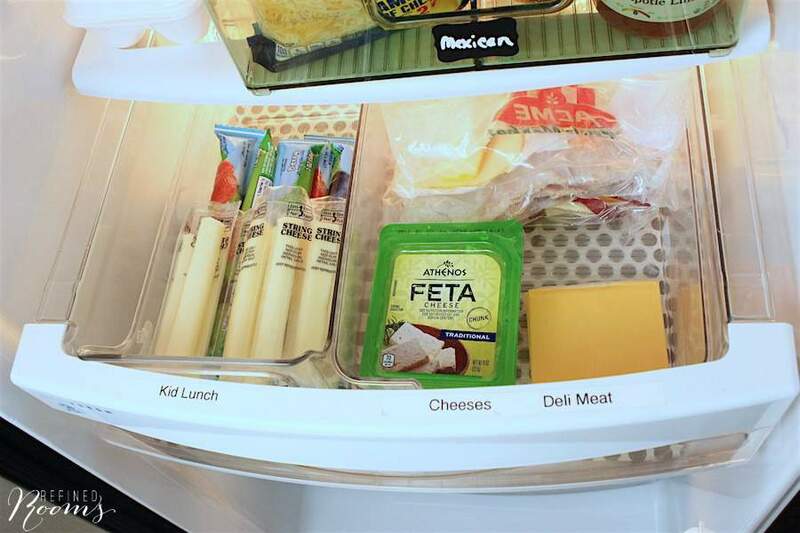 Within the deli drawer, I use Fridge Binz to further subdivide the drawer into a Kid’s Lunch zone, and a Meat & Cheese zone. UPDATE: Since this post, our pantry has undergone a major organizational overhaul. Come take a look! Moving on over to the pantry, I don’t know what I would do without my Pantry Door & Wall Rack. 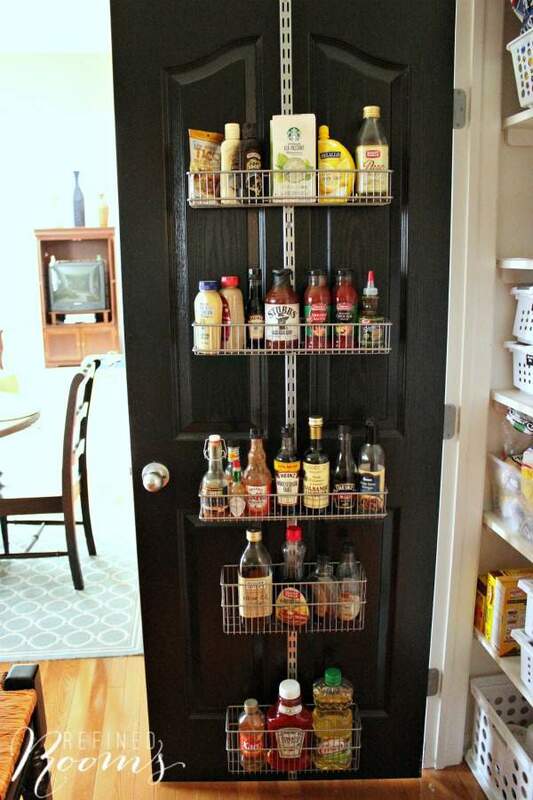 Using this vertical storage solution to store condiments and oils literally freed up an entire shelf in my pantry. 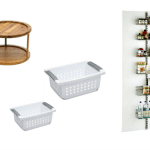 The pantry consists of a variety of zones, with items in each zone contained within baskets (I HEART stacking baskets, as you’ve heard before when I’ve talked about using vertical space to maximize storage and gushed about my favorite kitchen organization products. 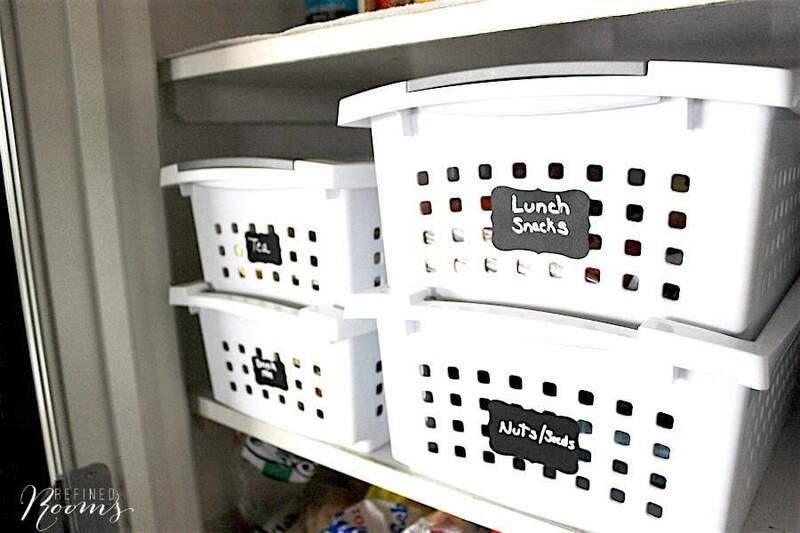 Labeling the baskets really does add some prettiness to this very functional pantry. More importantly, it makes it super easy to know at a glance where to locate a food item (and where to put it away when you come home from the grocery store). It also has helped my kiddos to become self-sufficient over the years. When it’s time for breakfast, they can easily grab the breakfast bins and pull them out onto the counter to grab what they need. 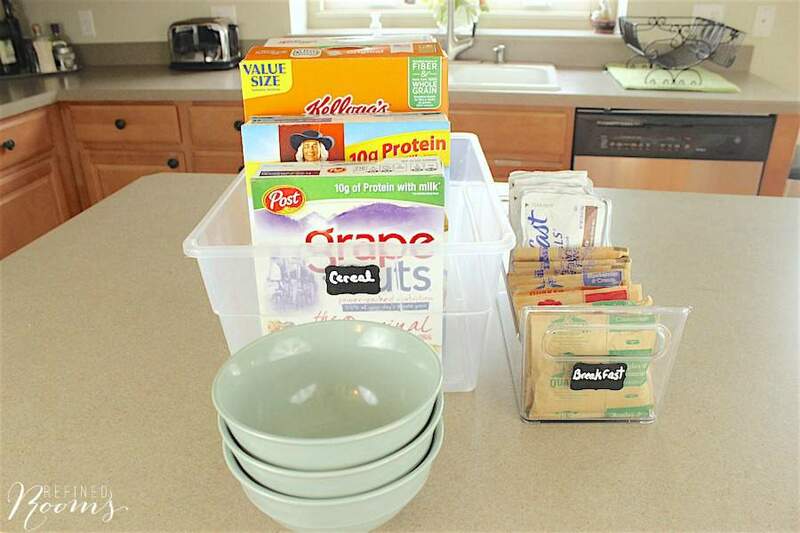 I also find that if you remove products out of their bulky packaging and store them in a storage bin, it saves a ton of space in your storage areas (I’ve wanted to do this for a long time with the cereal boxes, but my family has vetoed that idea, since they like to read the back of the box while they’re enjoying their breakfast…you’ve got pick your battles, right?). We store a lot of snack items for school lunches in our pantry. 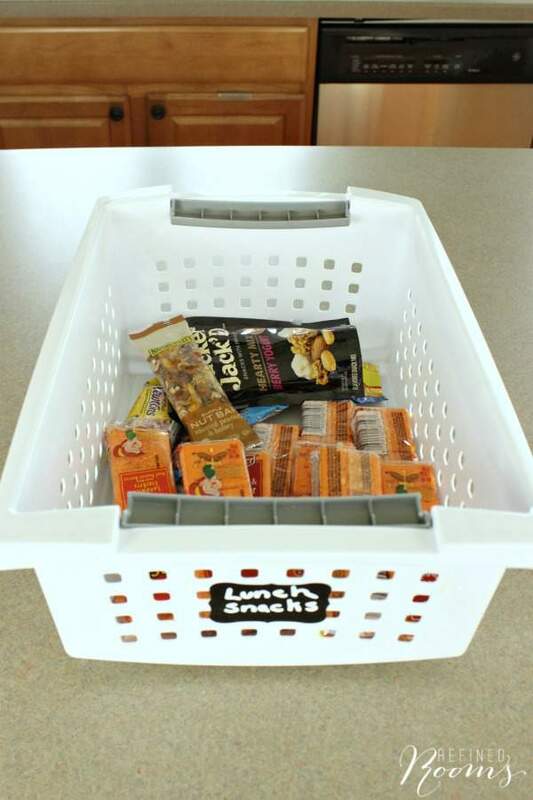 When we’re unpacking the grocery bags and putting the groceries away, these snack items are immediately taken out of their box and placed together into the Lunch Snacks bin that resides in the pantry. This little step really helps to expedite the lunch-packing process. 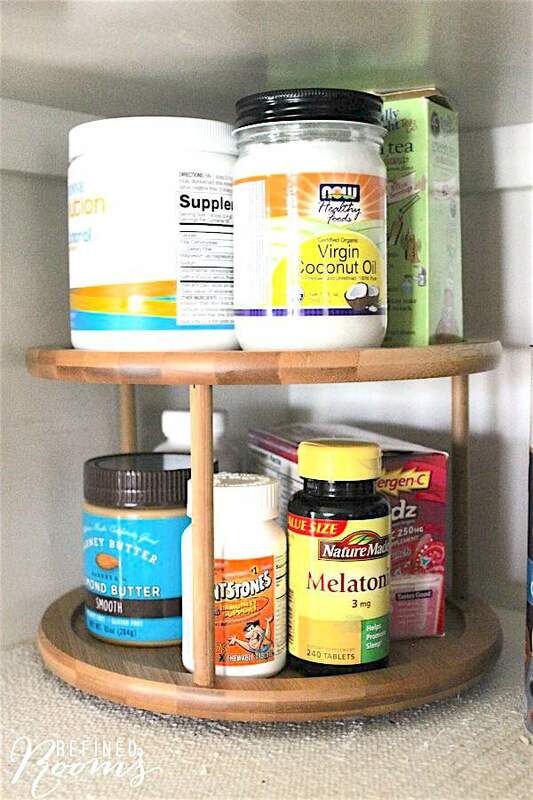 Another awesome pantry/fridge storage solution is the Lazy Susan. It’s perfect for corralling smaller items. Shelf helpers are also a girl’s best friend when it comes to storing canned goods in the pantry. I find that completing a quick weekly refrigerator clean out (just reviewing the contents of the fridge, NOT cleaning the inside) on the evening prior to garbage day is the key to keeping the fridge in order. Pair that with a quarterly pantry/freezer clean out, and you’ll be golden when it comes to your kitchen food storage spaces. After you’ve completed this week’s assignment, share a photo of your gorgeous pantry or refrigerator on Instagram (use the hashtag #OrganizeandRefineChallenge and don’t forget to tag me) and/or share it in the Refined Rooms Facebook community. « IS IT TIME TO DONATE YOUR WEDDING DRESS? I really like your tip about using appropriate containers to keep food items within the same categories. My wife and I go on weekly trips to the grocery store, and we buy a lot of things in bulk since we like to cook for ourselves. 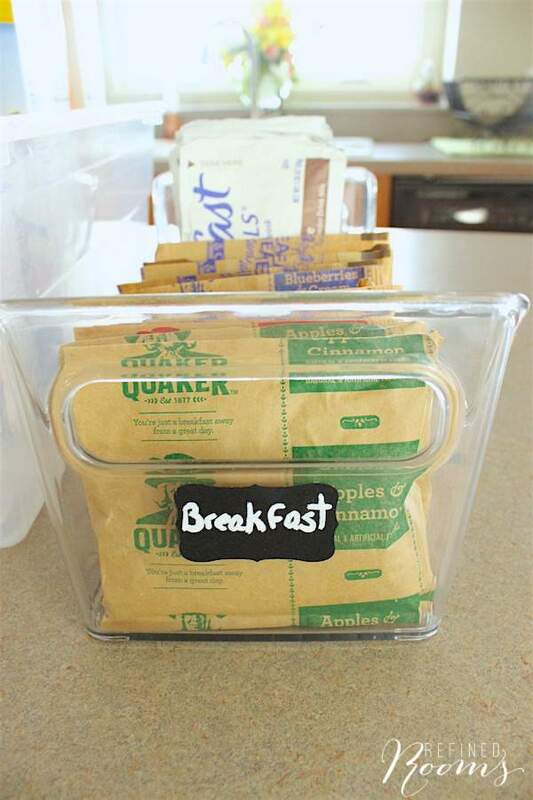 I’d definitely look for handy food storage containers that can keep our stocks more organized and accessible. Thanks! This is some really good information about kitchen storage. 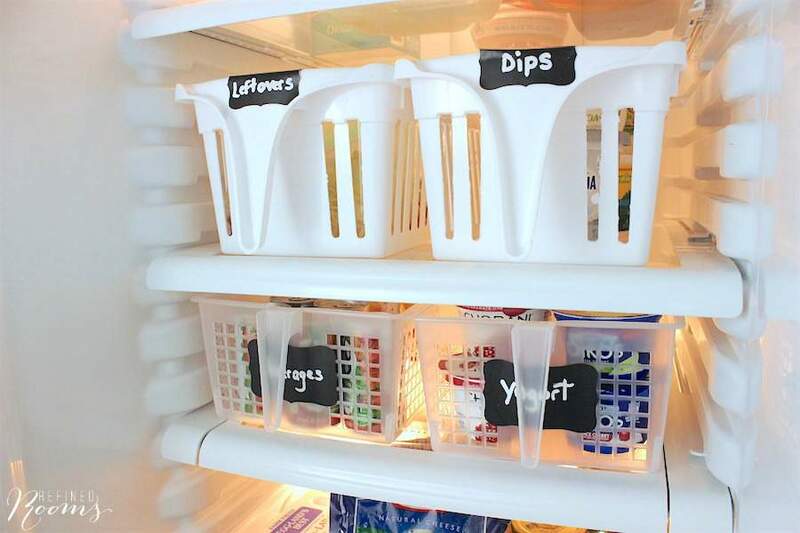 It is good to know that it would be smart to label things to help you remember what bins you put things it. I am planning on remodeling my home. I wonder if I can add some build in bins into my cabinets. I’ve never seen this said… so after you are set up and you have your dry food storage items in containers (flour sugar cereal, crackers, noodles, etc) where do you store the little bit leftover in the original packaging? Do you throw it? Do you wait until the plastic container is 100% empty before reloading it? ( now you have to store that new item somewhere!). Seriously, what is your solution? I haven’t encountered this challenge because my containers tend to hold more than the packaging holds (for pasta, etc. I don’t empty cereal into storage containers. Instead, I remove the inner bag out of the box, dispose of the box, then store all cereal bags in a large cereal bin. It works great for my family! I’m glad that tips are helpful Kimberly! 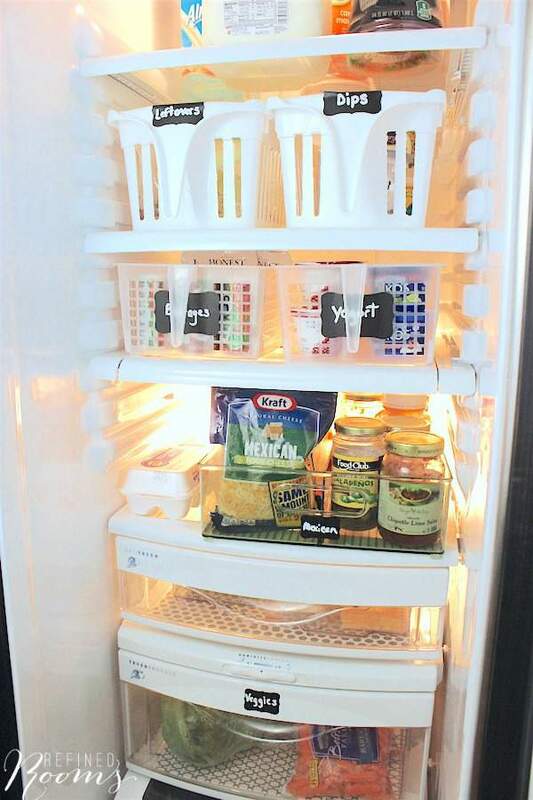 Containerizing everything in the fridge is such a simple, yet effective organizing method! So happy to hear that you were inspired Ann! This is a wonderful post, which I will share. 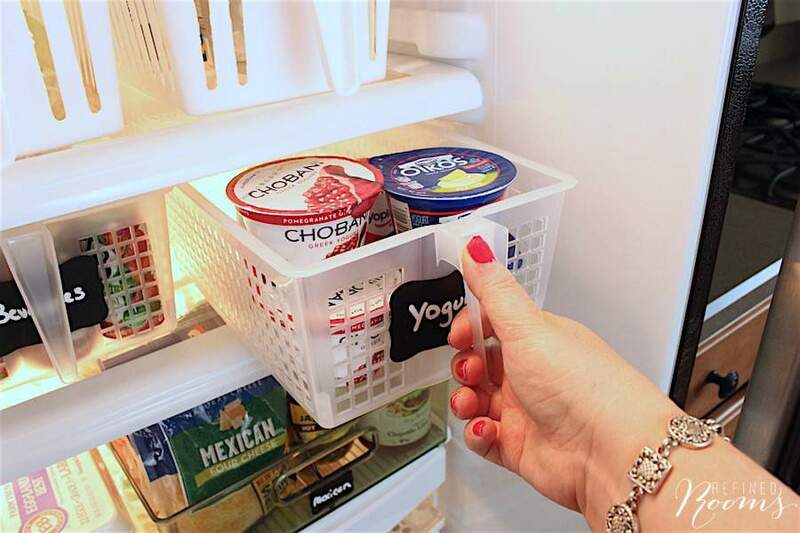 I also love using Fridge Binz, they really do make it so much easier to contain smaller items inside the fridge. Thanks Nancy! I’m a Fridge Binz Fan through and through! Pinning! Thanks so much for these ideas. I have bins in my fridge, but I love the handles! My cherries, olives, and marmalades will soon get a new home! 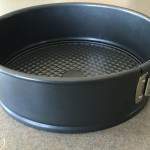 Yes, it’s amazing what a difference those handles make (and how many spills are prevented by having everything contained in a basket! Tanks for stopping by Lisa! Such amazing organization! I love how clean and easy to use it looks. I really need to get on my pantry with a system like this. Thank you so much for sharing. Thanks Mistie! It makes all the difference when it comes to finding what you need when you need it. Thanks for stopping by! Thanks for sharing on Monday Madness link party! I love this post! 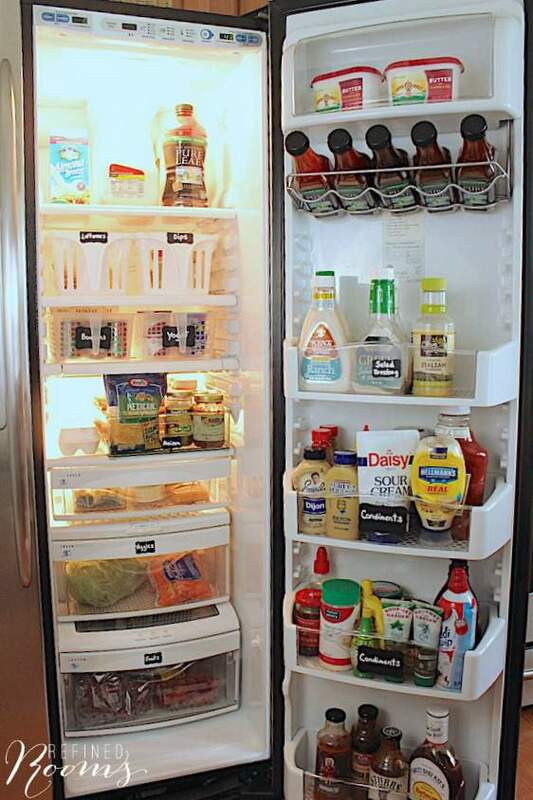 A clean and organized fridge means less waste because you know what you have to use! I have never used storage containers in the fridge before but I do like how they look! Thanks again for sharing on Monday Madness link party! Hope to see you there next week! Totally agree Sharon! Visibility and accessibility are key to avoiding food waste. I don’t know what I’d do without my handled baskets and fridge bins…I feel like they’re a necessity when you have a side-by-side fridge. I love Monday Madness Sharon! Thanks so much for hosting it. If loving the organizing process makes you a geek Christina, then I’m the biggest one of them all! So glad to have you as a new reader! The pantry and fridge are so hard to get organized! Love the tips for the handled bins…I even have a few extra lying around that I just might put to use today! Thanks for all the great tips! Yes Leslie, I don’t know what I’d do without my handled bins. 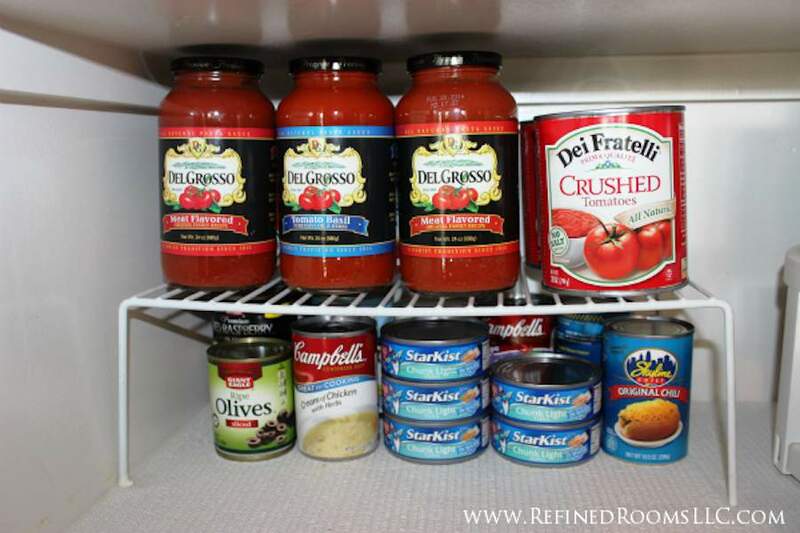 They’re perfect storage containers for pantry and fridge! Thanks for stopping by! OMG. Your kitchen is the organizer’s dream land. Seriously, I can only aspire to be that organized. 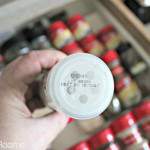 I love your tips about using and labeling containers. This would make it SO much easier to clean as well. Pinning, stumbling and tweeting this post as well. Not only do you have GREAT tips Natalie, I’m salivating at the organizational beauty of your fridge!! 🙂 I LOVE those handle baskets and am always recommending them to clients. Thanks for sharing your space and your insights! Great post, Natalie. I recently organized my fridge. I just got a new fridge and it had a very long and narrow deli drawer. I decided to replace them with containers to hold the food and labeled the top what the content was and now nothing is hidden and it works great. Yes Sabrina, I’m with you on the deli drawer. It can quickly turn into a mish mash of random items, with nothing easily accessible if you don’t subdivide those drawers. Thanks for stopping by the blog!